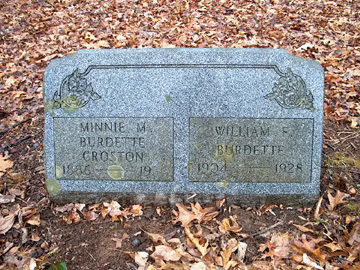 William Frank Burdette was the son of Other Alvin Burdette and Minnie May (Johnson) Burdette (Croston). Minnie was the daughter of Melville Shephard and Lucinda Bell (Cales) Johnson, also of Sandstone. After Other's death, she remarried to Gilbert Croston. She died 23 January 1978 in Beckley. Not sure where she is buried. The following obituary was taken from the Hinton Daily News dated June 20, 1928. Frank Burdette, aged 23, well known and highly respected young man of Meadow Creek died Monday at his home, death being caused by tuberculosis from which he had suffered some time. Mr. Burdette was a member of the baptist church at Meadow Creek and was a good Christian man. His death is one of the saddest the community has ever had and people mourn the loss of a most worth-while friend. He is survived by his father and mother, Mr. & Mrs. Other Burdette, one brother, John Burdette and one sister, Mrs. Chambers. Funeral services were held this afternoon at the Baptist church at Meadow Creek at 2:30 o'clock. The services were in charge of Rev. Henry Dillon of this city. Burial took place at the cemetery at Meadow Creek. Among those who left on #13 to attend the funeral were Mr. and Mrs. J. W. Burdette, Mr. and Mrs. J. H. Cales, Curtis Burdette and Mrs. John Harford. For those of you doing geneology, (although not buried here at Meadow Creek) I thought I would include the obituary of Frank Burdette's brother John E. Burdette. Before becoming ill, John supported the cemetery fund and will be missed by all. John E. Burdette, 92, of Hinton, died at 2:25 a.m. Saturday, Oct. 25, 2003, in Beckley Appalachian Regional Hospital. Born Nov. 21, 1910, at Meadow Creek, he was the son of the late Other A. and Minnie Johnson Burdette. Mr. Burdette was a yard conductor for the C & O Railway Company in Hinton. He was a 65-year member of the United Transportation Union. He was a member and local chairman of the Brotherhood of Railway Trainmen and was a delegate to their National Convention. He was instrumental in starting Little League Baseball in Hinton, and was active in the construction of the Little League Baseball Complex in the Bellpoint Park. He coached several regular season baseball teams, as well as All-star teams in Hinton. He was a former director of the YMCA in Hinton, and was a member of the First Baptist Church in Hinton. He was preceded in death by his wife of 69 years, Majorie Epperly Burdette, on Jan. 31, 2003; two sisters, Leora Harrah and Mildred Cummings; and one brother, Frank Burdette. Survivors include a son, Ed Burdette of Pipestem; one daughter, Jo Ellen Kerr of Hinton; one granddaughter, Cindy Ellis of Gulf Port, Miss. ; one great-granddaughter, Morghan Ellis of Gulf Port, Miss. ; several nieces and nephews, including Nancy Schultz of Okeechobee, Flas, Margaret Davis of Oak Hill, John C. Harrah of Cross Lanes, and Edward O. Harrah of Winfield.